A slow week at Galatoire’s Restaurant was crawling to a finish one evening last July. The cool and comfortable interior of our city’s second-oldest restaurant offered a nice retreat from the heat and humidity that permeated the street outside 209 Bourbon St. The ringleader of Table 40 knew how to win friends and influence people. He sent bottles of various French champagnes to all surrounding tables. Bottles flew down both aisles. Instead of rolling eyes and searing, dagger-like stares, the accompanying tables joined the party. They toasted their benefactors at Table 40 and shouts of “thank you” crisscrossed the room. As the evening customers washed down caramel custards with gifted champagne and began waddling home, the men at Table 40 turned up the volume. Their remaining audience was four or five lingering tables, including one with two younger local women. “I’ll pay anyone who can beat me arm wrestling $1,000, and if you lose you don’t have to pay,” shouted a big man with a bodyguard look. The stage was set. One of the waiters scurried to the kitchen to find the restaurant’s largest employee, a huge dishwasher-turned-fry-cook affectionately known as The Machine. Before The Machine could make an appearance, Bruce Pennington, a Galatoire’s assistant manager, jumped to the challenge. Neither man was a small dude. Both are muscular and well built, but the assistant manager is smaller for sure. The other men at Table 40 watched intently as customers and other on-duty restaurant managers cheered for Pennington. One of the young women at the nearby table caught it all on her cellphone video. Pennington held his own and even seemed to be winning at first – but not for long. He shifted his position, and almost instantaneously nearby watchers heard a loud crunch. Pennington screamed in pain, unable to move his arm. The “Is there a doctor in the house?” call brought out an orthopedist who helped stabilize the arm. Someone called for an ambulance. “Probably a dislocated shoulder,” said the paramedic at the scene, according to an eyewitness report. The emergency department at University Hospital was as busy as usual on a Saturday night when EMS dropped off Pennington. Patients with gushing blood and gunshot wounds take precedent. Finally Pennington had an X-ray, which vividly showed his diagnosis. He had a spiral fracture of his humerus: the large upper arm bone that connects the elbow to the shoulder. Pennington had emergency surgery lasting about three hours, according to a friend. He was released from University Hospital the next day in a soft cast. Hopefully his down time will be minimal, as the regulars at Galatoire’s want the personable Pennington back, whether he’s an arm wrestling champion or not. “That reminds me of the time Humphrey Bogart got beat arm wrestling,” says Dr. Rusty Oser, a neurologist at Ochsner and an old movie buff. “It delayed the filming of Beat the Devil. The problem then was Bogart. He was getting older, drinking more and still thought he was Bogart.” And Pennington has a great story to tell once he heals. Contrast this with poor Bogart – all he could ever claim is that he got beat arm wrestling the diminutive Truman Capote. The party resumed after the paramedics departed with the injured manager. Table 40 ordered their final bottle of champagne, supposedly a Mathusalem with a price equal to eight regular bottles. The final tab for Table 40 was $9,094.98, topped by a $10,000 tip for popular, soft-spoken waiter Shelly Landry. But you knew that part of the story, to borrow from Betty Guillaud, as a copy of the receipt posted on Instagram made local news. “You know I can’t talk about that with you,” says Melvin Rodrigue, head honcho at Galatoire’s, when asked the following week if PayPal co-founder and billionaire Jack Shelby was the man behind the broken arm and the $10,000 tip. An occasional thing that happens at Galatoire’s stays at Galatoire’s, but not much. 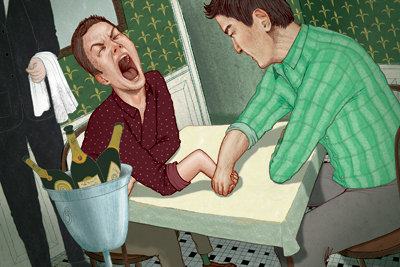 Arm wrestling is a popular one-on-one sport often starting on a dare and fueled by alcohol. While rules are simple and equipment requirements are nil, except for two willing participants and a hard surface to anchor the elbows, injuries involving arm and shoulder structures are more common than most folks realize. Sudden onset of elbow, arm or shoulder pain during arm wrestling usually means a tendon or ligament is injured. Strains are defined as stretched or torn muscles or tendons, while sprains refer to damaged ligaments. Most heal without surgery. The humerus is the long bone that connects the shoulder to the elbow. Actual bone fractures are more serious and often need surgery. In arm wrestling, the humerus is the bone most at risk for fracture. Other serious injuries requiring surgery include rupture of the biceps tendon and fracture into the elbow. Fortunately these complications are very rare.